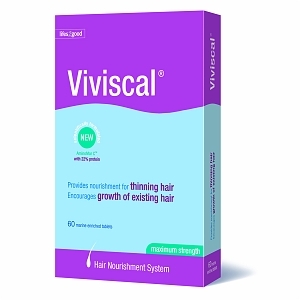 Viviscal is a patented marine-based hair treatment formulated to promote healthy hair growth in men and women. Thinning hair is a concern for many women with statistics reporting that one in three women will experience the problem at some stage in their lives. The Tablets contain the exclusive AminoMar C Marine Complex that supplies vital nutrients needed to nourish thinning hair and promote existing hair growth. The manufacturers have conducted clinical studies on the effects of Viviscal on the scalp and thinning hair. 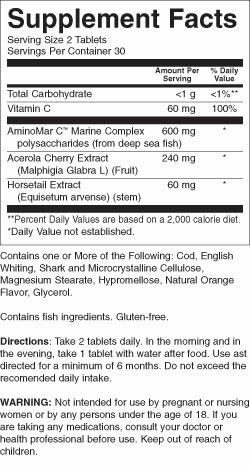 In a placebo-controlled, double-blind, parallel-group study, young male subjects with mild to moderate androgenic alopecia were administered either Viviscal or a fish extract. After 6 months of treatment, researchers found that 95 percent of Viviscal participants showed a clinical or histological improvement, compared with the fish group. Furthermore, there was a 38 percent increase in hair count in the Viviscal group. "In conclusion, Viviscal appears to be the first highly active treatment for androgenic alopecia in young males," the study authors write. Another study conducted at the Helsinki Research Center in Finland and Dermatological Clinic in Germany, examined the effect of Viviscal supplementation and topically applied Viviscal shampoo on 20 patients with alopecia ariata and 20 patients with alopecia totalis. After eight months of treatment, researchers found that 85 percent of the alopecia ariata patients were cured, two showed significant improvement, and one patient's condition worsened. In addition, 25 percent of the alopecia totalis patents were completely cured, 20 percent showed significant improvement and 11 patients developed only minimal vellus hair. "This promising study showed that Viviscal is a further complement to the rather short list of remedies which alter the clinical course of alopecia areata and alopecia totalis," the study authors write.